If you're looking to make your weight-loss goals a reality, attend this free 90-minute orientation program sponsored by the Sharp Rees-Stealy Center for Health Management. Participants will be given information about a variety of nonsurgical weight-loss options available through Sharp HealthCare. 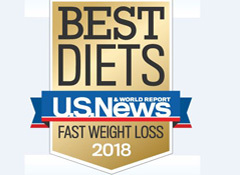 Named a 2018 "Best Diet" for both weight loss and fast weight loss by U.S. News & World Report, our advanced weight-loss program helps you get the most out of your experience. Sharp Rees-Stealy Center for Health Management offers safe, supportive and effective solutions to help you lose weight and keep it off. Our goal is to help you achieve a healthy lifestyle through programs that are structured, personalized and easy to follow. You'll gain practical skills to make balanced and nutritious food choices, increase your physical activity and take control of your environment — three keys for successful, long-term weight management.